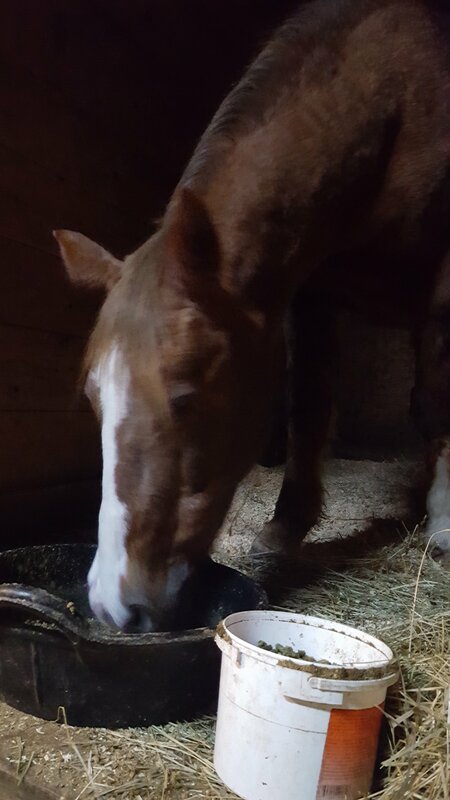 Jessie, the 32 year old mare, suddenly stopped eating Friday. Completely unlike her. I was a bit perplexed by the behavior, because otherwise she seemed completely fine. I monitored her Friday for any signs of distress, but other than not eating her hay pellets and grain, she seemed absolutely normal. Monday, I had the vet-dentist out. 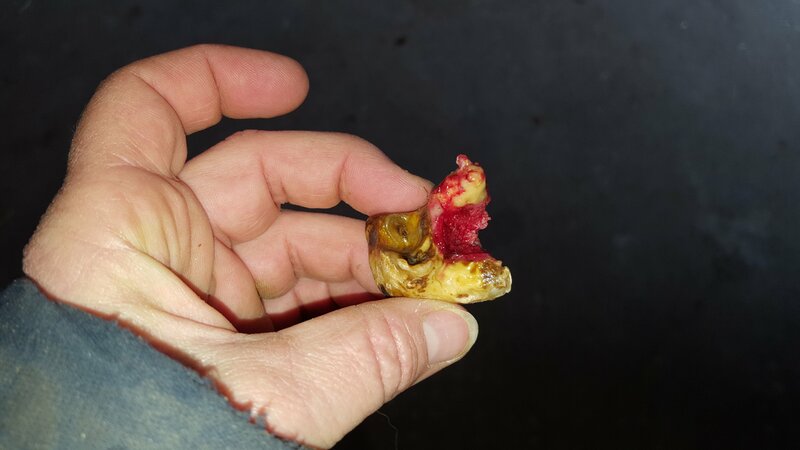 One of her teeth had broken, half was flopping around, and the other half well embedded. Vet pulled it. I nearly barfed. Vet had Jessie all doped up. Nicely sedated, lidocaine to numb the area, a shot of banimine when she was done. I could’ve used some sedation when I got the bill! Ack!! It’s now Wednesday, and Jessie still won’t touch her regular grain. I had to switch it out with the grain I feed my two. She devoured that. No idea why her grain, that she used to love, is no longer an option. I’m also forced to shove antibiotics down her gullet twice a day like dewormer since she is being so picky about her food. 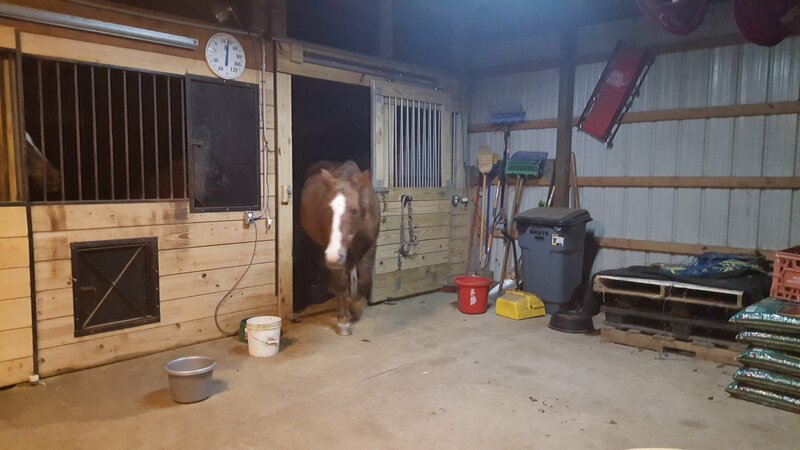 The paste is now coating the barn floor, my saddles, in my hair, all over my coat, and even on my glasses. I am not doing so well getting it to stay in her mouth. Any wisdom on food stuffs the old gal might eat? It seems like the mushier it is, the less she likes it. So far she’s only interested in the hard stuff. Add water and she immediately turns her nose up at it. Which perplexes me. I would’ve thought mushier would be better. She hates any type of syrups. She’s not all that fond of applesauce or apples. I keep putting out different food options for her to try. 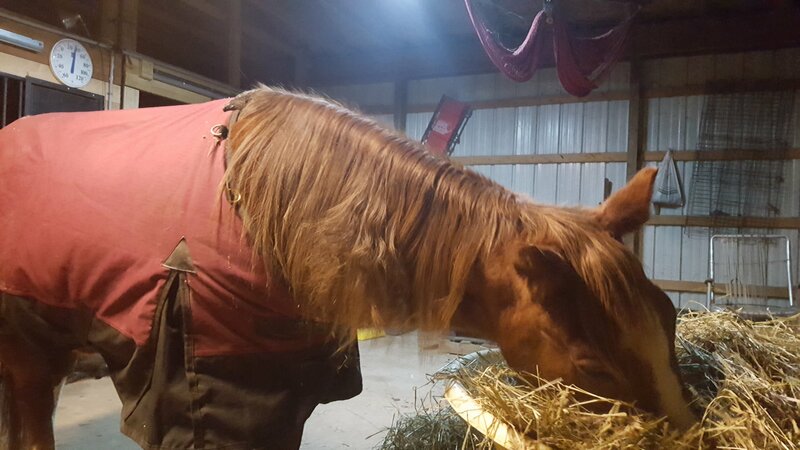 She can’t really eat hay, she just cuds most of it up and spits it out, but she gave it a go anyway. 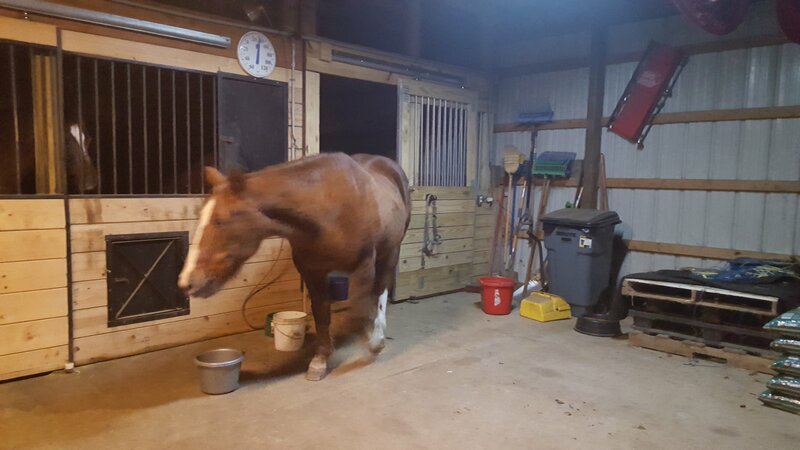 Yeah, ok, sometimes I let her wander the barn… Not the safest thing to do, but she’s so level headed… and sllooooowwww…. I hope she gets back to her old, with gusto, eating habits soon. I hope it was just that tooth, and no other issues crop up. 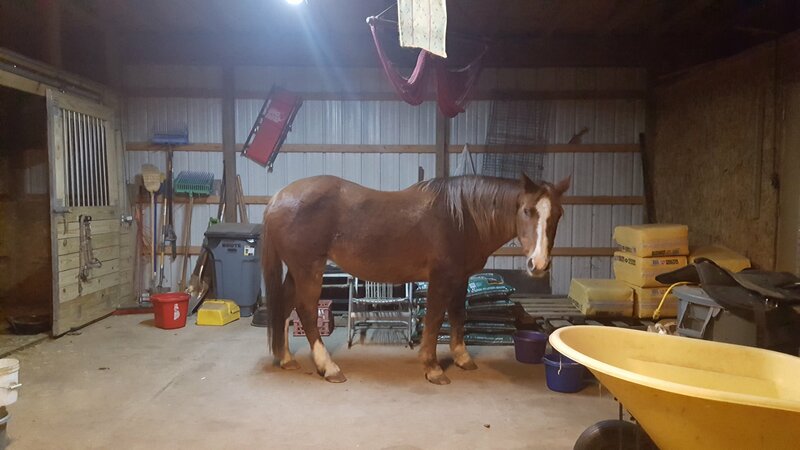 She’s such a sweet mare. Other than the tooth issue, the vet gave Jessie a glowing report on her health. Great lungs, great heart, remaining teeth look great. Google says that the average mare has 36 teeth. We’re down to 33 now. She’s lost 3 in one year! Ouch! 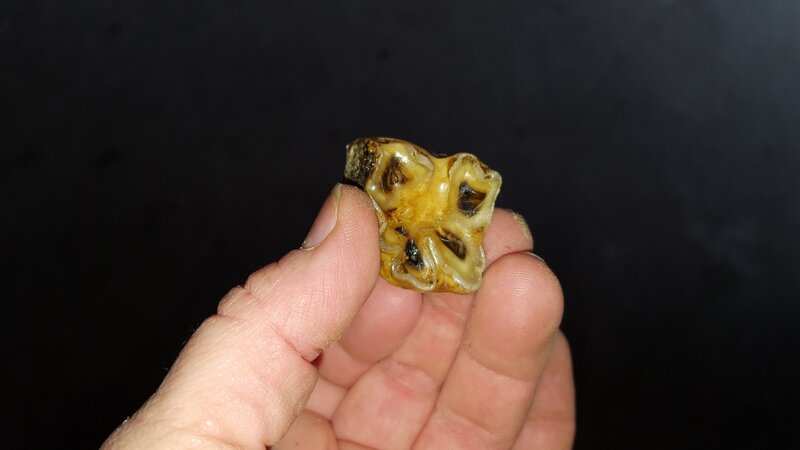 Not much left to pull on a 32 year old tooth! Yeah, I was surprised how short it was. Alfalfa cubes soaked but not too mushy just softened?